The best Lubbock fence company we know is of course our sister company, Lubbock Fence Builder. Installing new fences, and repairing existing fences is what they do best. We wanted to feature them here on our website since we know many of our local customers actually have family living in Lubbock, Texas, and we know when it comes time for a new fence that getting a referral is the best. So here you go and you are welcome. They do specialize in building new fences, but also do more than that. Building gates, both automatic and manual gates, sliding and swing is also something we do every single day. 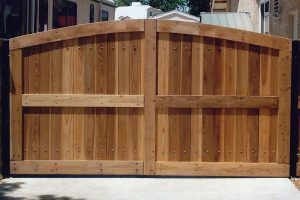 So no matter what type of gate you need, they have got you covered. Fence staining and sealing is very important with the South Plains weather, and they are experts when it comes to staining your fence. Add more life to your fence by having it stained and sealed before it is too late. Wooden decks. Hey that is not a fence. Yeah we get it, but we as fence builders have the same tools, and knowledge of building, so we might as well help you with this aspect of your back yard too. Building wooden decks is a specialty and will make your home look amazing. Give yourself a treat and ask them to quote you on building the backyard deck of your dreams. Building Pergolas and Arbors. Again much like the thought process of deck building, creating custom pergolas and arbors will give your backyard a distinct flare. They build with style, precision, and longevity in mind so that your backyard oasis will be the talk of the town. If you are in the market for an arbor or pergola, contact them today for a free quote. Back to the fence building. The quality of work that these guys do is amazing. They use the best quality materials when building fences, decks, arbors and pergolas. This in-turn will ensure that your investment lasts as long as possible. For fences the use cedar as it is known to be a decay resistant wood, and makes for a great looking fence too. Not only is cedar durable, but it is also colorful and fragrant as well. With the harsh weather of the South Plains, your fence will last a long time and look good to boot. Steel fence posts are also used. Not just any steel fence post, but thick contractor grade galvanized posts are used to again ensure the long life of your fence. If you are not located in one of these cities listed above, they can still help you with your fence and gate needs. Give them a call and they can work out the logistics and give you a quote.